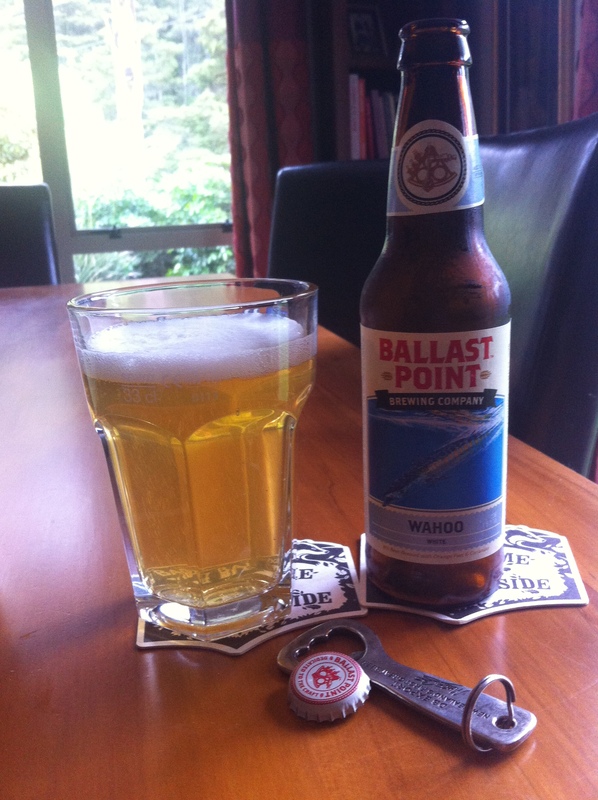 It’s BeerJerkNZ beer club beer of the week, and it’s a real change of paste with the Ballast Point Wahoo, a Witbeir. 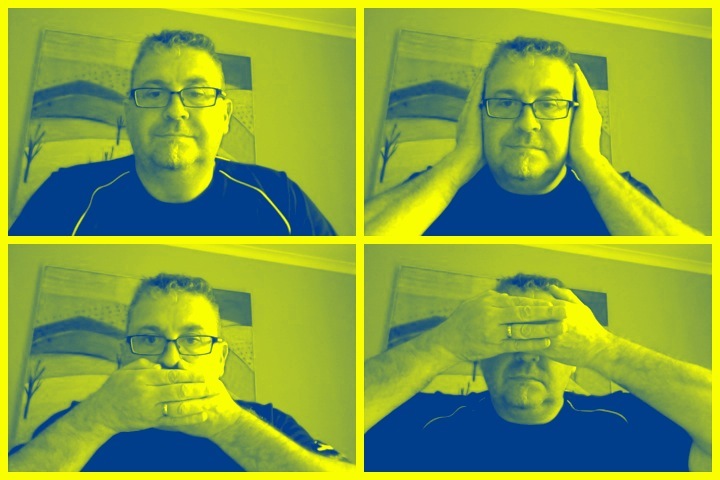 A Day late, because I wouldn’t have appreciate it yesterday, I’m sure I won’t be expelled from the club though. Ballast Point Wahoo Wheat Beer is created using the same ingredients that were once used in Belgium. Flaked unmalted wheat, oats and malted barley comprise the grain. The unmalted wheat has a high protein content, which causes the beer to be hazy, thus giving it a cloudy, or white appearance. A special yeast gives a refreshing tangy flavor that is different from both the sour Weiss beers of Berlin or the banana and clovey Weizens of Bavaria. The mild hopping allows the unique malts to show through and does not conflict with the subtleties of the citrus spicing. This unique citrus character is created by adding a blend of curacao (bitter orange). A fresh, unfiltered brew perfect for lazy summer days. Our Wahoo White is brewed with unfiltered, un-malted wheat and oats that give it a distinctive cloudy complexity. True to the Belgian tradition, this Witbier boasts a refreshing, citrusy flavor thanks to the orange peel and coriander we add to the boil. This makes Wahoo an ideal beer for year-round beach weather. Aroma is familiar as a Witbier style, slightly sour but cushioned on a sweetness. Pour is a lovely bright yellow, slightly hazy and a fairly firm white head of fluff. The aroma has the earthy aspect to it, again, not unfamiliar. It’s not quit as sweet as I expected, but there is a full mouthfeel and a sharp citrus tang in the profile, and lots of linger and after-taste left at the end to enjoy. But it is very refreshing and easy drinking, and I’d suggest a fairly good take on a witbeir style. I’ve manage to quaff a fair amount without hesitate and with some enjoyment, I’d be happy to go again with this, it has a lovely level of engagement in the taste, if you like the stye of beer though. For some this might be too fruity, or citrusy, and the aroma might be odd or off-putting. Not me though, I thought it was a bit of a win, and reminds me that summer is coming and this is the kind of beer you need in the sun. The pdubyah-o-meter rates this as 8 of its things from the thing. It’s nice, well behaved, and competent beer, it isn’t spectacular, doesn’t have overly full flavours or mouthfeel, and there isn’t massive amounts of taste lingering, although there is some, it is just a nice quenching drinking beer that I really enjoyed. Am I enjoying it? Yes, but then I like the style. Would I have another? Yes, summer is coming and not soon enough. Would I share with a friend on a porch and set the world to rights? You could as a starter to an evening because this washes away the day and sets your palate for something, either another, or something else. Music for this : “Cowboy Junkies ” “The Trinity Session“ except this time I have it on CD, and it’s not on Spotify, but they have this Cowboy Junkies are a Canadian alternative country/blues/folk rock band. The group was formed in Toronto in 1985. It’s a thing from the past that sits just as good today. 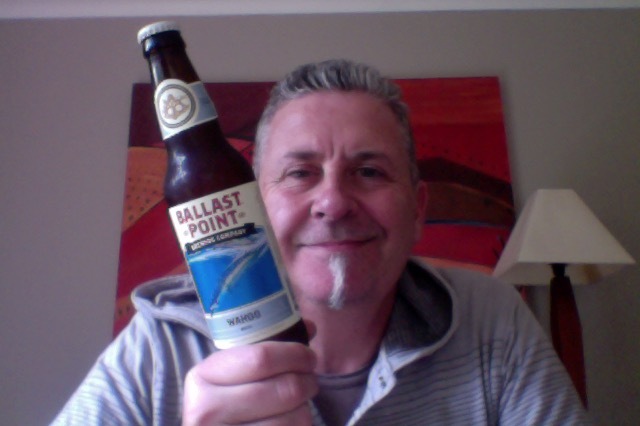 This entry was posted on November 20, 2015 by Philip Walter in Ballast Point, Beer, Beer of the USA, Beer Review, Craft Beer, Critic, Wit Beer and tagged Alcohol by volume, Ballast Point, Ballast Point - Wahoo, Ballast Point beers, BeerJerkNZ, craft beer, San Diego, Wahoo, Wheat beer, Witbeir.